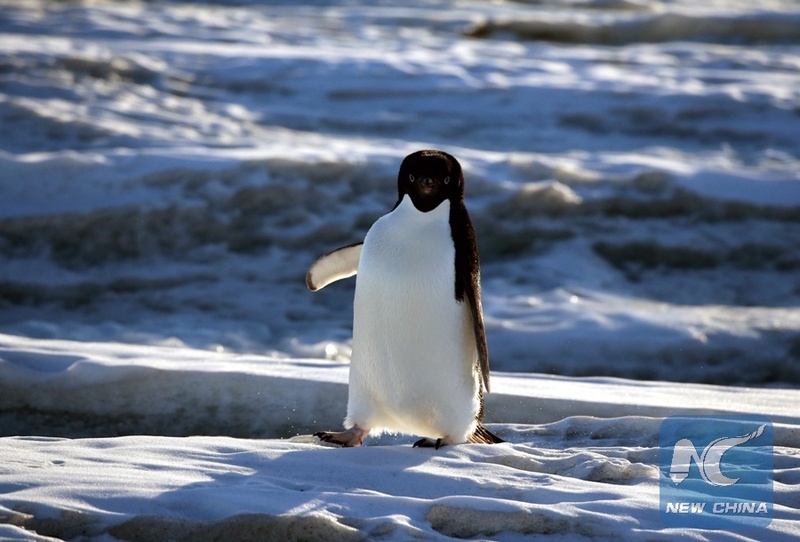 WASHINGTON, June 13 (Xinhua) -- Two studies published on Wednesday in the journal Nature revealed that starting from about 15,000 years ago, the ice sheet in West Antarctica partially melted and shrunk to a size even smaller than today. But instead of collapsing, it began to regrow later. However, much of East Antarctica remained frozen during at least the past 5 million years. The new findings could not be considered an antidote to today's fast global ice contractions but could help refine predictions about how today's warming climate will impact polar ice and sea level rise, according to the studies. Researchers led by Northern Illinois University geology professor Reed Scherer, Jonathan Kingslake from Columbia University in the United States and Torsten Albrecht of the Potsdam Institute for Climate Impact Research in Germany found that the ice sheet below sea level partially melted between roughly 14,500 and 9,000 years ago and shrunk to a size even smaller than today, but it did not collapse. Over the subsequent millennia, the loss of the massive amount of ice spurred uplift in the sea floor, a process known as isostatic rebound. Then the ice sheet began to regrow toward today's configuration, according to the study. "It retreated inland by more than 1,000 kilometers in a period of 1,000 years in this region," said Albrecht. "Instead of total collapse, the ice-sheet grew again by up to 400 kilometers. This is an amazing self-induced stabilization." However, given the speed of current climate change, the mechanism does not work fast enough to save today's ice sheets from melting and causing seas to rise, according to Albrecht. "What happened roughly 10,000 years ago might not dictate where we're going in our carbon dioxide-enhanced world, where the oceans are rapidly warming in the Polar Regions," said Scherer. "If the ice sheet were to dramatically retreat now, triggered by anthropogenic warming, the uplift process won't help regrow the ice sheet until long after coastal cities have felt the effects of the sea level rise," said Scherer. In addition, the ice modeling did not find grounding-line retreat and rebound-driven re-advance in the Amundsen Sea region, where present-day grounding-line retreat is causing concern about future runaway collapse. "So what's happening today in that sector is troublesome and could be a wildcard in all this," said Scherer. In another paper, a team of researchers has found that the land-based sectors of East Antarctic ice sheet did not retreat significantly over land during approximately 5.3 to 2.6 million years ago, when atmospheric carbon dioxide concentrations were similar to today's levels. Much of the East Antarctic ice sheet is land-based. Coastal regions and floating sheets of ice permanently attached to a landmass, known as ice shelves, are marine-based. The ice shelves are more sensitive to warming temperatures. "Based on this evidence from the Pliocene, today's current carbon dioxide levels are not enough to destabilize the land-based ice on the Antarctic continent," said Jeremy Shakun, lead author of this paper and assistant professor of earth and environmental science at U.S. Boston College. The researchers measured isotopes produced by the interaction between cosmic rays and the nucleus of an atom, called cosmogenic nuclides, in glacial sediment from Antarctic's largest ice shelf. If the sediment contained significant concentrations of these nuclides, researchers would know the region wasn't covered in ice because it had been in contact with cosmic rays. "The concentration of beryylium-10 and aluminum-26 in these sediments is profoundly low. They show no indication of being exposed to cosmic rays," said Marc Caffee, a co-author of the paper and professor of physics at Purdue University in the United States. Likewise, the fact that some ice on the southern continent was stable in a warming climate does not signal that Antarctica can somehow backstop the impact of climate change, they cautioned. "Marine-based ice very well could and in fact is already starting to contribute, and that alone holds an estimated 20 meters of sea level rise. We're saying that the terrestrial segment is more resilient at current carbon dioxide levels," said Shakun.